Application and Application Field of Tellurium - Changsha Santech Materials Co., Ltd.
Tellurium is commonly used in photography, printing and dyeing, chemical reagents and meat preservation. Tellurium is mainly used in desulfurization and deoxidation of steel in iron and steel industry. It is also used as an additive of alloy to improve the strength, hardness, elastic limit, wear resistance and corrosion resistance of steel. In high alloy steel, it is also used as austenite combination element, used for refining stainless steel, special alloy steel, stainless steel welding rod, etc. Tellurium accounts for 42 % of the total application in metallurgical industry. Due to the rapid development of tellurium application in photovoltaic field, the proportion of metallurgical industry shows a downward trend. Tellurium is used to improve the machinability of copper alloy. Adding tellurium to tin, aluminum and lead-based alloy can increase the hardness and plasticity of the alloy. Adding tellurium to lead can be used to make cable sheaths. Adding 0.03 % - 0.04 % tellurium to cast iron and steel can reduce nitrogen absorption of cast iron and steel, change grain size of steel, and improve strength and corrosion resistance of steel. Adding 0.001 % - 0.002 % tellurium to cast iron can make its surface firm and wear - resistant. Tellurium has a noticeable effect on microstructure, crystallization process and mechanical properties of cast iron, and its whitening tendency is at the top of all elements. This tellurium - treated steel has been used in mines, automation, railways and other equipment. In the photoelectron industry, lasers, photodiodes, photoreceivers and the like involving infrared to ultraviolet spectra adopt semiconductor components ZnTe, CdTe, HgTe, HgCdTe and the like. 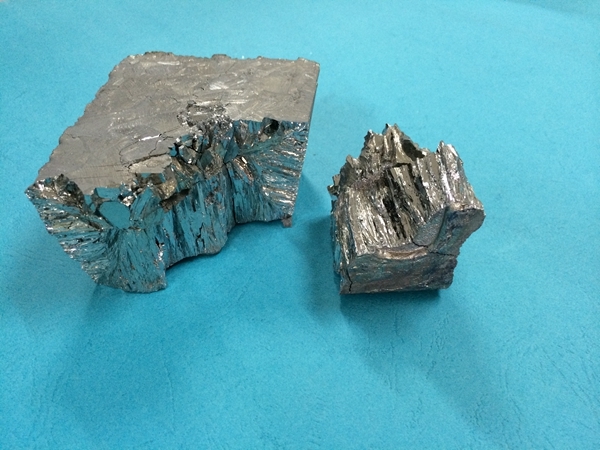 Telluride compounds of lead, tin, mercury and cadmium are sensitive to infrared radiation, PbSnTe and CdHgTe compounds are important infrared photoelectric materials, tellurium is an important raw material for producing infrared materials. Mercury cadmium telluride compounds are the main photosensitive materials used in infrared detectors of military and space systems. Cadmium telluride ( CdTe ) is used in photoelectric systems due to its good light absorption characteristics. The high purity tellurium used in military in the United States is 99.99999 %. Using the excellent photosensitive property of tellurium - containing compounds, they showed outstanding advantages in resource survey, satellite aerial survey, laser guidance and so on, and were fully demonstrated in the modern American war against Iraq. Tellurium is an important photoresist element in photographic plate making, laser printing and photocopying. It is the above-mentioned properties of tellurium in photoelectron that play an important role in the most attractive industry in the 21st century.